The Sheepie Jimba Jimba is a totally different Rooftoptent because it opens like a Dutch Canopy. But is being different better? Read the review or watch the videoreview for all the pro’s and con’s on the Sheepie Jimba Jimba. The Sheepie Jimba Jimba that I am reviewing here is made by the Dutch camping equipment company Sheepie Products and for the Dutch market this model is distributed by Daktent.nl. The Sheepie brand is becoming more and more widespread over Europe and the rest of the world so if you looking for a local distributer, just visit their website. The Sheepie Jimba Jimba might be from the Netherlands but the idea for this type of rooftoptent originated in the Australian Outback in late ’90 of the previous century. That is the reason behind the company slogan: ‘Spirit of Australia’. To point out that Sheepie products are made for tuff outback like circumstances. The manufacturing is – like most rooftoptents – done in China. That’s enough on the background of the tent. On to the Jimba Jimba itself! 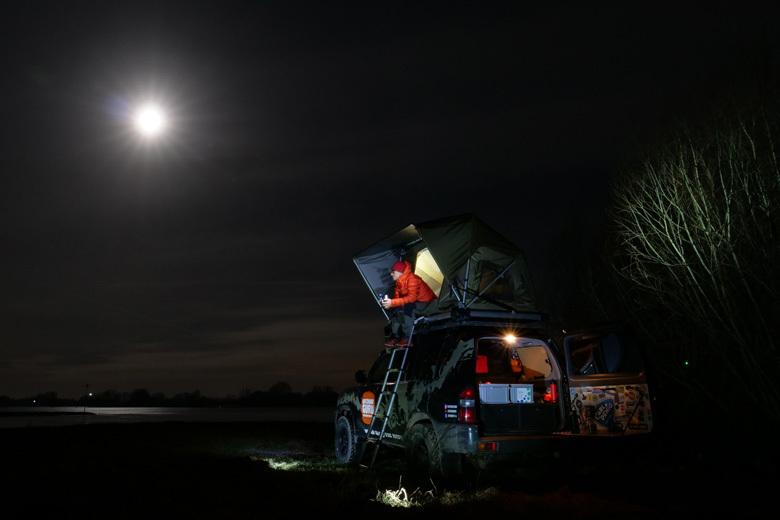 Roof top camping at its best! In basics the rooftoptentsworld is divided in two methods of construction: hardshell and softshell. The first being like a big box that opens in to a ‘tent’, the second that folds open like… a tent. The Sheepie Jimba Jimba belongs to the second. 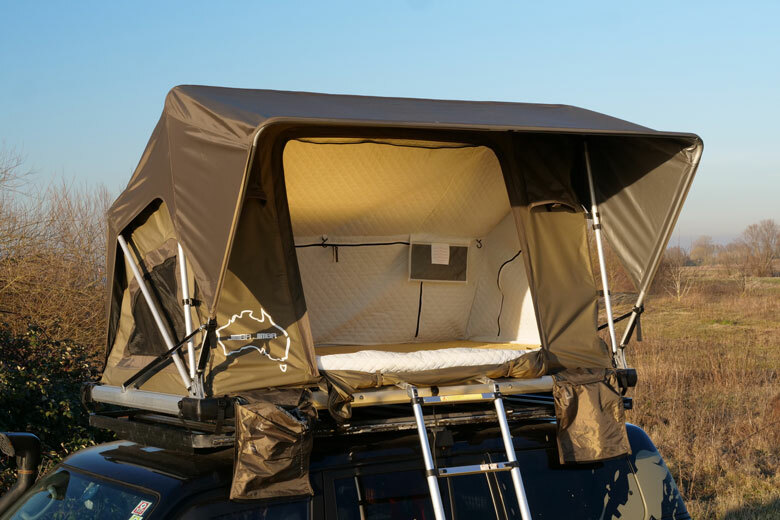 The packed tent has a box-like shape on the top of your car and is available in two sizes: in Medium 132 cm x 215 cm and Large 152 cm x 215 cm. The sleepingspace size is different but more on that later. I am testing the Medium that has a packet height of 25 cm on the highest point. The Medium has a weight of 39 kg and the Large weights 42 kilograms. For most cars the weight should not be a problem but always check the cars specifications or ask your dealer. I tested the Sheepie Jimba Jimba on top of my 1998 Toyota Landcruiser Prado J95 and the weight is not issue here. 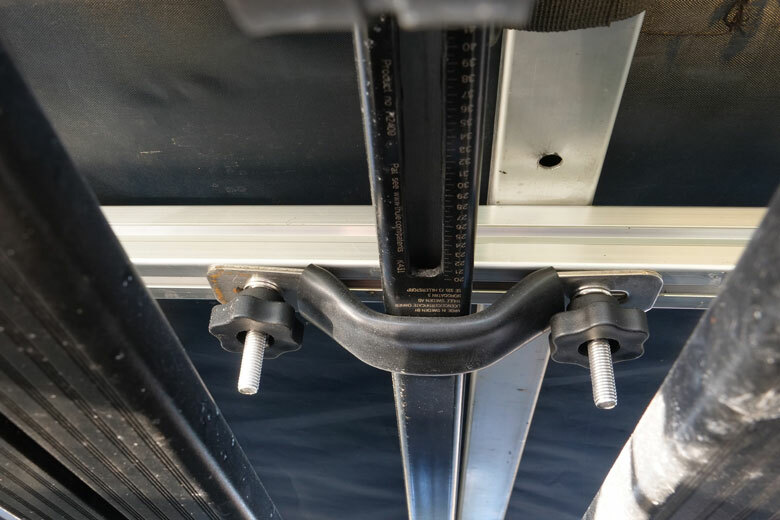 On my car I have a Front Runner roofrack and just because of easiness and speed we – yours truly and the men from Daktent.nl – mounted the tent on top of the roofrack with two loadbars from Thule. Not the most optical clean solution but effective. This makes the total height a bit higher then necessary. The most clean and clever construction is just to use two loadbars fitted to the roof of the car. Fitting the Sheepie Jimba Jimba is easy: it comes with a good set of brackets, spacers and nuts and bolts. Tools are not needed. Thanks to the low weight the Jimba Jimba is easy to handle with two persons. The connection to loaders is simple but effective. The Sheepie Jimba Jimba is constructed around a base of solid square aluminum bars. You could compare it to a slatted bed base. 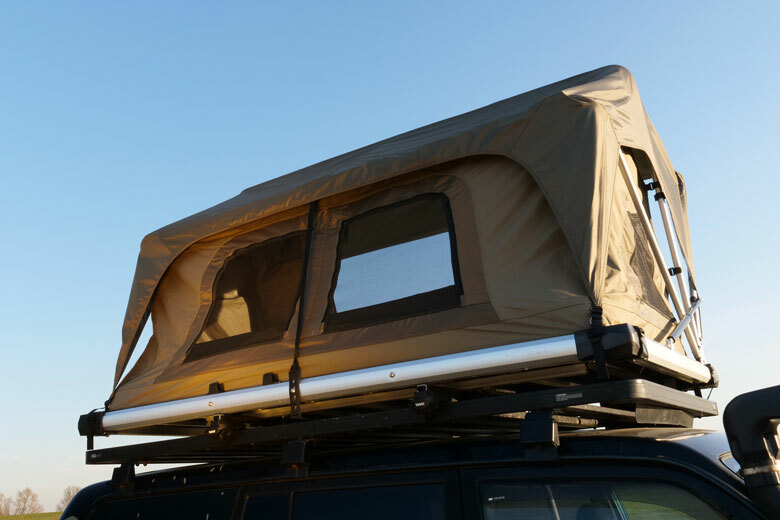 This is different then most rooftoptents that have a solid baseplate from aluminum or woord. In the aluminum base all connections are screwed or riveted; no welding is used. On the corners the Sheepie construction is well protected with plastic covers. 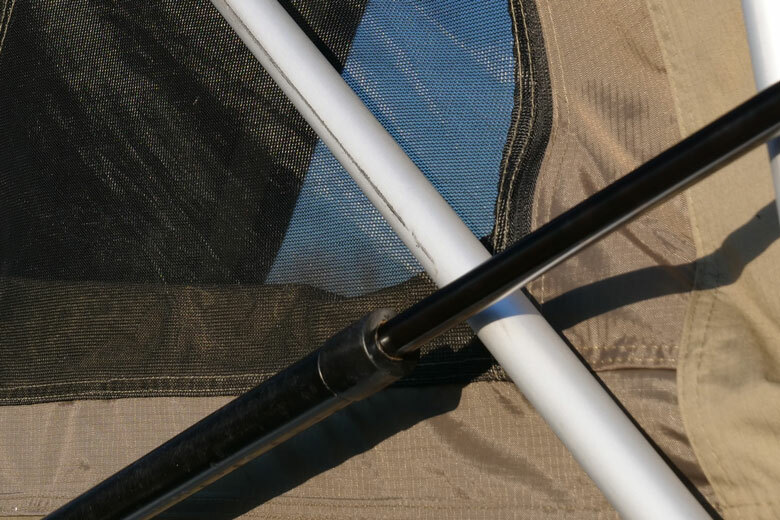 The tent ‘poles’ are round aluminum bars that are connected to the base with plastic parts. I would prefer this to be metal. To pitch the tent two gassprings are attached to the base and the poles. Big plastic protection on all corners. A nice aluminum part but the connection with the poles is plastic. The tent itself has an ‘inner tent’ and a fly. The innertent is the one you are sleeping in, the fly is the rain cover with the canopy attached. The main fabric of the inner is a 190 gr/m2 ripstop polyester-cotton mix fabric. The fly is 210 gr/m2 ripstop polyester-oxford fabric. Both fabrics have a Polyurethane coating that makes them waterproof. All seams are neatly taped to make them waterproof. The inside of the fly has aluminum colored coating. The reason behind this is not clear to me. It might reflect heat so that the inside temperature is a bit higher. Clearly visible is the double roof construction. When the Jimba Jimba is not used, a soft cover protects it. The cover is made from a very heavy duty Bisonyl fabric. This is waterproof and sturdy so if you take a dirt road with low hanging branches this is not a problem. With colder weather the material is quite inflexible and tougher to handle. To secure the cover to the tent it uses straps and metal hooks. 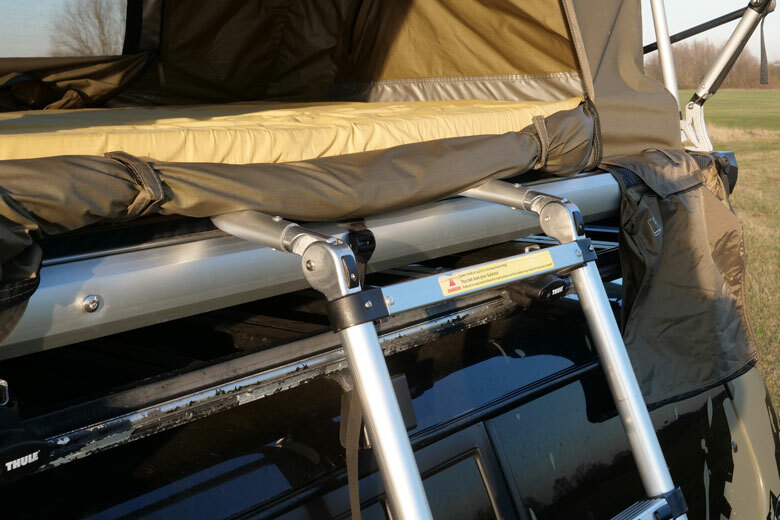 On a roofrack it is not the most consumer friendly system: especially fitting the small hooks in small holes under the tentbase is fiddly but with only the loadbars this shouldn’t be a problem. It takes a good 10 minutes putting the cover on. Because the tent is not totally flat when packed, it happens that with rain a lot of water is collected on the cover. Be careful when you start driving or with braking: big splash over the front window! With freezing temperatures you should pay extra attention. With the cover removed – 5 minutes work – pitching is fast en easy. 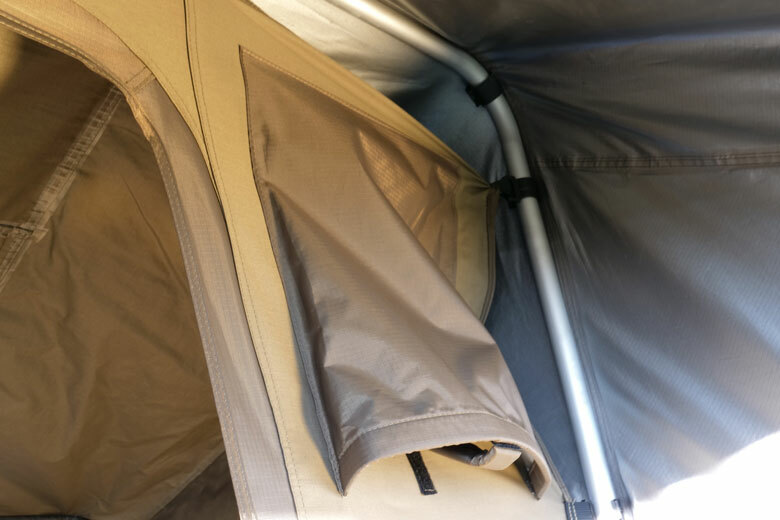 Just unhook a strap and the gassprings pitch the Dutch canopy tent opens in a soft 10-second sigh. The telescopic ladder is easy to use and fits also taller cars like my Toyo. 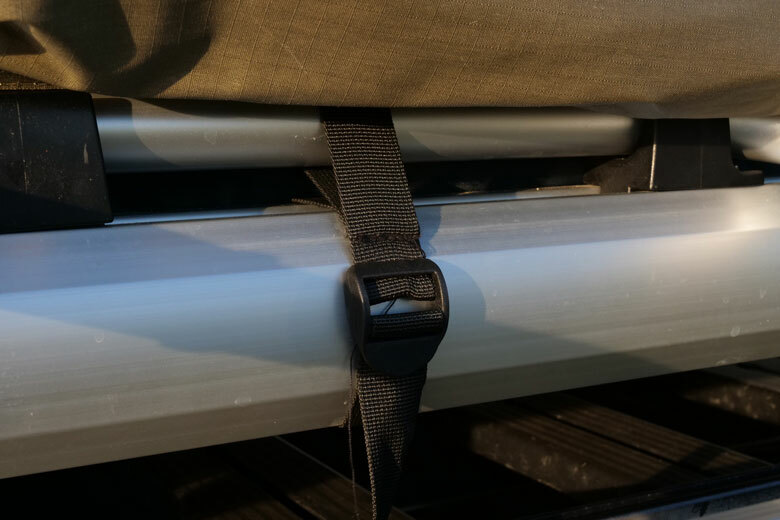 The top fits in two plastic clips but securing the ladder with a strap (provided) is necessary. The ladder ads a 6,5 kg to the total weight and is stored in the car. Not in de tent like some other rooftoptents. I feel so sleepy in the Sheepie Jimba Jimba. Getting in the tent is easy if you are able to climb a ladder. The Jimba Jimba (JJ) has one large door on the side with two zippers. Next to the door are two super waterproof pockets for shoes. Because the door opens from top to bottom, I need to unzip the door totally to get in. Once in the tent I discover that the outside measures are way smaller on the inside. The size of the bed is 116 x 198 cm and that is very snug for two adults. Interior height is about 105 cm and that is pretty descent. I am small (1.69 cm and 63 kg) just like my wife and we manage. If you are alone, a single parent with one child or pet… no problem. Are you are taller, bigger and heavier: I strongly recommend the L version of the JJ. In the back the JJ has two small pockets to store a smartphone. I miss a cup- or bottle holder. In the ceiling there are some spots to attach a light to. And because of this one entry the person that sleeps in the back must crawl over the person that sleeps next to the door. Just that you know. 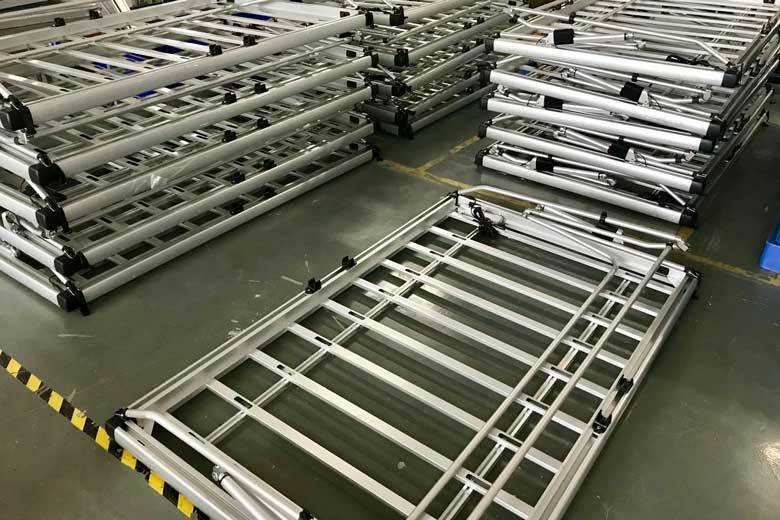 The ladder is clipped to the main frame. 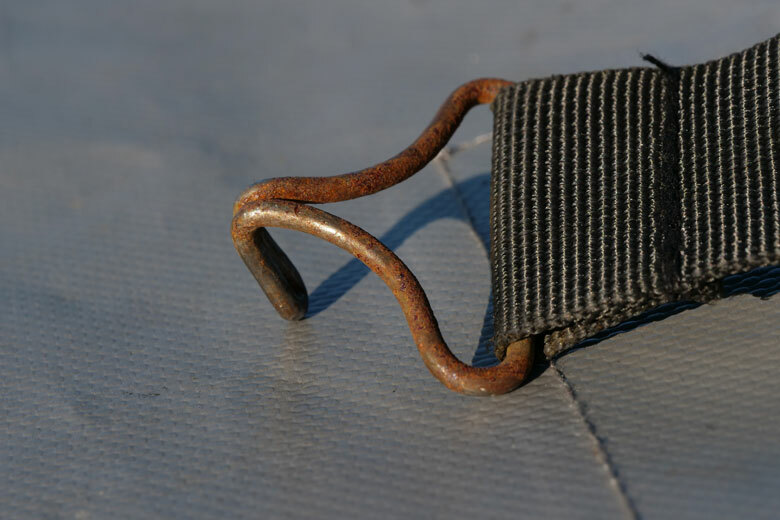 A strap is used to prevent the ladder from getting out of the clips. The mattress in the Jimba Jimba is 65 mm thick. Underneath the mattress is a – optional (price below) – anti-condensation mattress that is 10 mm thick. And… underneath this one is the bottom of the tent: a 50 mm thick ‘mattress’ from foam. This total combination is resting on the ‘slatted bed base’ as mentioned above. In the almost three weeks that I was able to test the Sheepie Jimba Jimba I noticed several times that I found the top mattress very soft. Even with my tiny weight I sunk quite deep in to it. Also the mattress takes a bit to long to my liking to recover. Did I sleep any less or did I sleep poorly? No, it’s just that I think that those who are heavier than I, should be aware of this. Positive is that the send tent is pretty dark! Good if you travel up North! The mattress is 65 mm thick. The 10 mm thick anti-condensation mattress is a option. One of the good things of the Sheepie Jimba Jimba is the fact that it has a lot of ventilation. Next to the entrance there are two small ventilation-openings that are covered. Why, don’t know because they are well sheltered by the canopy. You can remove the canopy – the fly as you wish – but why would you want this. 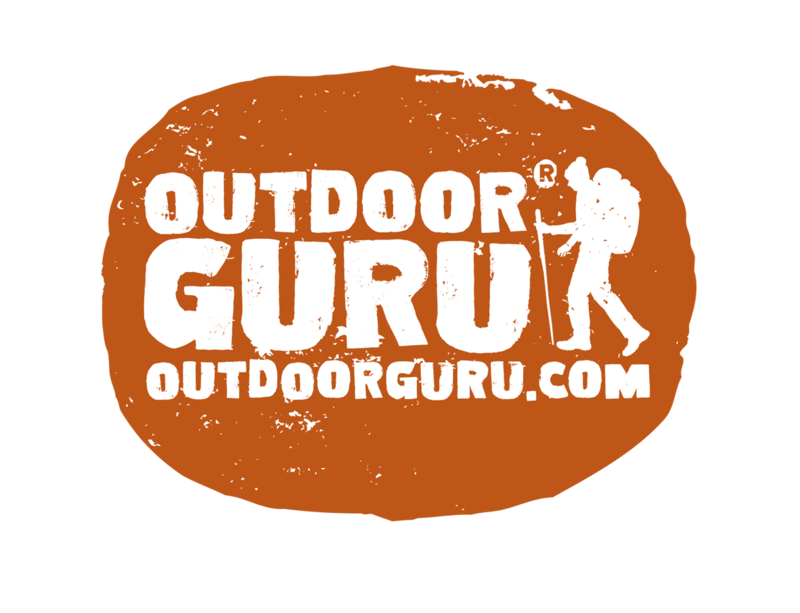 With warm summer weather the fly keeps the temperature down, in winter and with rain: you need it! The door has a mesh in the top part. 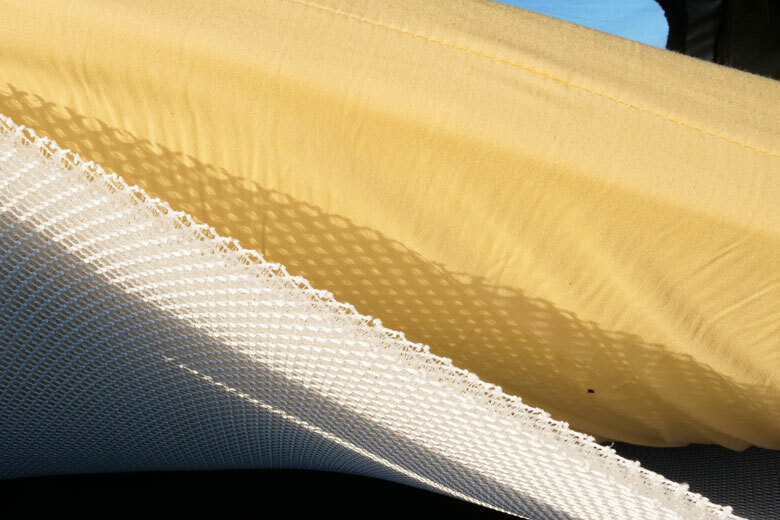 This mesh can be covered with fabric to keep the warmth in. The same is for the smaller windows on the short ends of the tent and the double window opposite the door. With some ventilation-openings open and the double roof, the JJ has hardly any problems with condensation. Covered ventilation-openings under the canopy…. I mentioned the optional anti-condensation mattress already. This works and I would advice you to buy it. 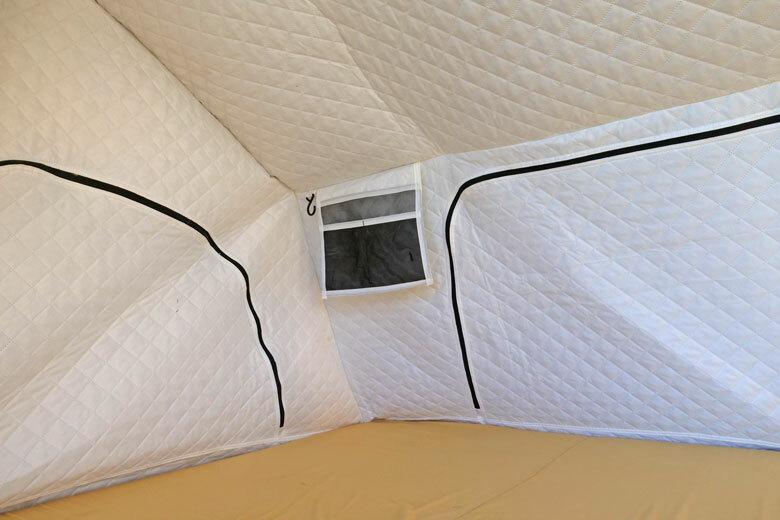 It gives airflow under the mattress keeping you dryer, warmer and more comfortable. 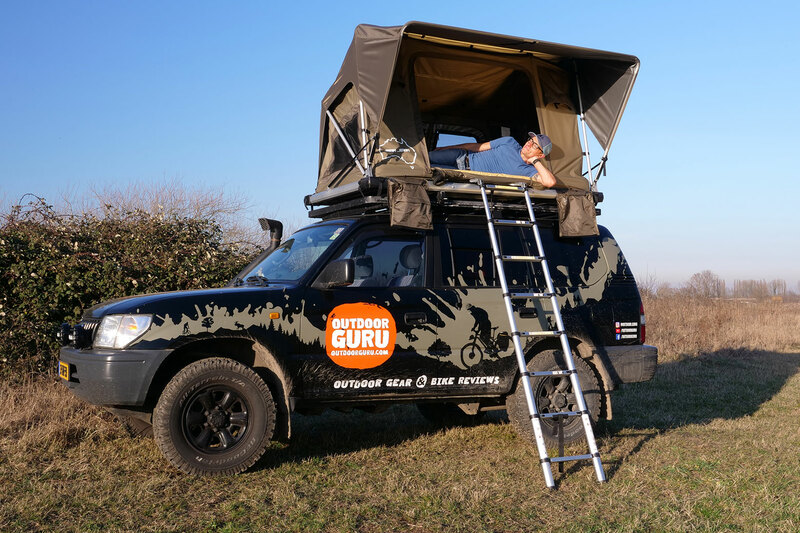 Most rooftoptents are made in or made for warmer dry countries. But tents that are sold and bought in Northern-Europe – same Northern parts of the US or Canada – should be foul weather proof. Since rain and wind are always different I developed a rain-simulator. Sounds good, doesn’t it! It is a garden hose that is connected to a piece of pipe with nozzles. The nozzles spray fine to medium waterdrops. Normally I use it with tents, but for RTT’s I connect the pipe to a large ladder and spray water on the tent from al directions. Hail to the Sheepie Jimba Jimba! It is completely waterproof and even de canopy keeps the entry sheltered from wind and rain. And honestly… I didn’t expect that! Be ware of one thing: the canopy is quite flat and some water accumulates here and when you step on the ladder the tent moves forward a bit… a big splash will poor over you. I was able to test the JJ with a brand new cold weather isolation liner for the inner tent. The cold weather isolation liner makes a a 3 to 5 degrees difference. After camping there is always the moment you have to pack the tent again. 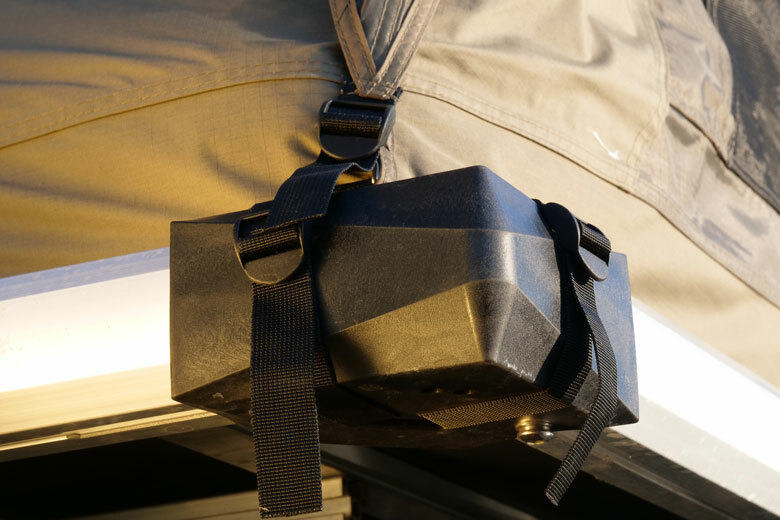 You do this by pulling the strap at the rear of the tent and the canopy folds back. With the door closed this is not easy; the tent is like a big bellow with the nozzle closed and the air trapped in it. The trick with the Jimba Jimba is that you must keep the top of the door open so the air can escape. And now I have a negative point of the JJ. Packing with rain makes the tent wet and if the door is open… a wet – if you are really fast, moist – part of the mattress. So, practice and be quick in packing. Overall I do like the build quality of the Sheepie Jimba Jimba, but I do have a few remarks. First: I don’t like that the hooks that secure the cover already stared rusting after two weeks. Ok, wintertime so salt on the roads but still. I talked to the Daktent.nl about this and this was news to them so I may have just that one. Second: I think that the placement of the straps could be better. Now they are not easy to pull tighter and getting the tent flatter on the car. Third: I don’t like that the hooks already stared rusting after two weeks. Ok, wintertime so salt on the roads but still. 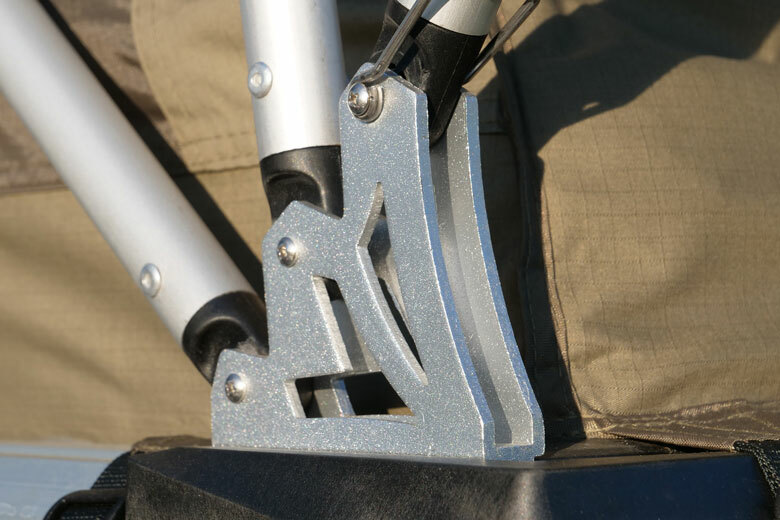 Fourth: I would prefer metal connectors between de aluminum poles and the base. Fifth, and this is a more serious one: The gassprings. After a few days with rain I discovered that the seal on the gasspring is not waterproof. I saw a bit of rust developing on the lower end of both gassprings. Result of this is that the gasspring started to be less smooth and started closing with a stutter. And the opening sight is a small squick. I bit of oil did the trick but oil and tent fabric are no friends. So be careful. Also I think the solution is even simpler. Now the gassprings are placed with the seal facing upwards and so water collect on the seal. Place them the other way around and the seal is facing downwards. But this is probably to easy thinking. Daktent.nl is aware of the rust and for the 2019 models that are sold now they promise me this problem is solved. I found some rust in the gas springs after a while. Rust on the hooks of the cover. That should not happen. In the three weeks that I was able to use the Sheepie Jimba Jimba I had a lot of fun. It will fit most car roofs thanks to the low weight. Pitching is easy. Packing a bit a hassle. The big door is a joy with good weather and a perfect place to enjoy the sun. With rain it is a small disadvantage. The canopy protects the entry well from rain or overloads of sun. The double roof and the ventilation are super. The optional anti-condensation mattress is a must buy. 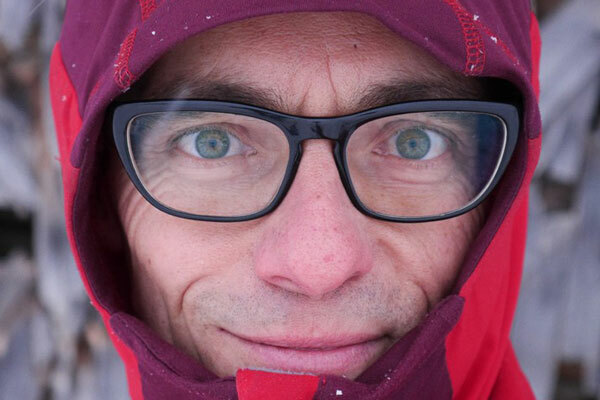 The winter liner is a good option if you travel to colder regions or if you want to prolong the camping season. The JJ has proven to be 100% waterproof. I would prefer a bit harder mattress. Improvements can me made to the cover, the hooks and the gassprings. The price of the Sheepie Jimba Jimba is € 1.289,00 for the Medium and € 1.449,00 for the Large. This is not expensive for a rooftoptent but it is neither cheap. Overall I rate the Sheepie Jimba Jimba at 3,5 stars or 7.1/10 points.